Product #634 | SKU BEX1622USB | 0.0 (no ratings yet) Thanks for your rating! 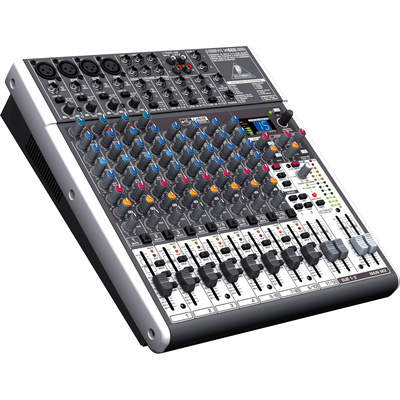 The XENYX X1622USB - 16-Input USB Audio Mixer with Effects from Behringer is a 16-input audio mixer with an integrated USB computer audio interface. It enables you to mix together and shape the sound of multiple audio signals, and route the audio to several outputs. Special attention has been paid to the quality of the X1622USB's 4 microphone preamps, "British" style EQ, and 4 easy-to-use one knob compressors. The X1622USB provides four mono channels and four stereo channels, making it ideal for smaller and medium sized audio tasks. There are two aux sends on every channel (which enable you to route individual channels to stage monitors or external effects), and two stereo aux returns. Every channel features a 3-band EQ with a swept mid, which can really help you make vocals and instruments stand out in a mix. The built-in USB interface allows for a bi-directional transfer of audio to and from your computer. The energyXT2.5 software is compatible with Mac, Windows, and even Linux operating systems, and includes virtual keyboard instruments and drum machines. The built-in 24-bit dual engine effects processor features 16 presets that include, reverb, chorus, flanger, delay, pitch shifter, and multi-effects. You can edit the parameters of every preset, and a tap tempo button is included to sync time-based effects. The 4 built-in compressors are designed to simplify the process of controlling dynamics in your mix. With a single knob you can dial in the amount of compression you need for any given sound. Individual compressors are a feature rarely seen in mixing boards in this price range. The 4 XENYX preamps offer 130dB of dynamic range, and the 3-band "British" style EQ's really allow you to create a fine-tuned mix. The XENYX X1622USB is well suited for recording studios, video editing suites, live sound mixing, podcasting and more.